The Chinese-made aluminum alloy yacht Tiger Shark leaves on her maiden voyage from Qingdao Olympic Sailing Center on Saturday. It is Asia’s longest aluminum yacht. The 734-ton yacht is 50 meters long, 10 meters wide and 16 meters high. It can sail continuously for 6,000 nautical miles, and is capable of sailing around the world. Tiger Shark models exquisite luxury, including a bar, a tea room, VIP room, audio-visual entertainment bar and so on.The ship cost nearly 200 million yuan. 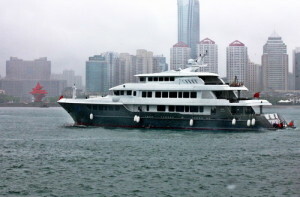 Industry experts estimated the Chinese yacht-making industry will grow 20 percent this year.